If you find pruning fruit bushes difficult you’re certainly not alone. The diagrams in books may look very straight-forward, but it’s a whole different story when faced with your own, undiagrammatical, pruning challenge. Still, it has to be done if you’re not to end up with a tangle of unproductive branches and here, in the in the northern hemisphere, it’s just about the right time to get out the pruners, although you can prune at any time during the plants’ dormant period, up until early spring. A lot of soft fruit belongs to the genus Ribes, which is handy as it means that once you understand how to prune one type, you’ve got a handle on most of the others, as they’re treated in a similar way. So once you know how to prune gooseberries, you also know what to do with redcurrants and whitecurrants, and with the less common Worcesterberries. In this article I’ve assumed that you have mature bushes over two years old. Pruning for younger plants is generally slightly different and is more for shape. If you bear in mind the reasons for pruning, then the whole business becomes much easier. First, you’re aiming to allow light and air into the middle of the bush, as this discourages disease. It also means access to all the lovely fruit is easier later in the season. You want to keep branches clear of the ground, so try to anticipate the depths to which they’ll sink when laden with fruit. You’re also pruning for is shape. If you have a "stool" or bush which has several stems arising from the ground, then you’re aiming to create a framework of branches that grow away from the centre. If you have bushes that are grown on a single leg (which is probably up to 20 cms (8 inches) long before branching), you want to create and maintain a goblet shape. Either way, you’re aiming at a framework of up to ten main branches adorned with short spurs along the length of each. Finally, you’re pruning to encourage new growth, as older wood becomes less productive after three or four years. First keep the leg (if you have one) clean by removing any growth emerging from it up to the point that your bush branches out properly. You may also see suckers growing around the base of the plant. It’s best if suckers are removed in summer by pulling (not cutting) them away while they are still soft. However, if some got away from you last year, you’ll need to cut them away now. Now look for any branches that are dead or diseased and cut these away. So far, so good. This is where you begin to prune for shape, opening up the middle of the bush or creating that goblet. This part is harder as you’re removing healthy wood. I think it takes a certain, brutal mentality to be really good at pruning, but steel yourself to the task and keep reminding yourself why you’re doing what you’re doing. Remove branches that are too low and which will become entangled in any weeds that might shoot up when you’re not looking, or might rest the fruit on the ground. To keep the middle of the bush open, remove stems and branches that are congesting the centre of the bush and any others that are very close together or crossing each other (if they rub together they might allow canker into the wound). Wood that’s up to three years old tends to be the most productive, so you ideally want a mix of stems that are one, two and three years old. Prune out the oldest stems to allow space for next summer’s new stems. Now look at the main stems, or leaders, that you’ve got left. These need to be cut back by half of the new growth from the past year. If the bush is becoming too big for the space, then you can replace an old leader by allowing a side-shoot lower down the stem to grow up and replace it. If you want to do this, then cut the leader back to just above that lower shoot. Keep in mind that these bushes produce fruit on small spurs on older wood and also, more so with gooseberries, at the base of last year’s side-shoots. So you want to reduce the side-shoots to two buds, in order to ensure the plant directs its energy to the fruit that these will produce. Finally, one more thing to bear in mind is the habit of the bush. Some gooseberries are quite laid back and tend to sprawl around like teenagers (the cultivar "Careless" comes to mind). When cutting stems back on these, it’s best to find an upward (or inward-facing) bud because the branches will tend to grow downwards. Cultivars of a more upright nature can be pruned in the usual way, to an outward facing bud. "I'm new to Ribes. You mention that you should keep the "leg" clear. What is that exactly." "Hi, Bill As I say, bushes are often grown, either as "stools" where several stems grow straight from the ground, or on a leg, where a single, short trunk emerges from the ground and then it's been shaped to branch out further up, usually around 4-8 inches above the soil. So, you want to ensure that branches do not develop on the leg. " "Hi, Good article but I have just bought gooseberry and red currant bushes as young bare root plants recently!!!. What pruning do they need?" "Good article and easy to follow; I think perhaps I have been too brutal in the past. However I did inherit some gooseberry bushes and planted these last year- they "look" old with greying stems and a sort of craggy look about them - some even have a kind of moss on them - I tried to clean them up - but last year I only got lots of lovely green leaves no fruit can these be saved - or are they ready for the bonfire? " "Hi, Peta. If the bushes responded with lots of green leaves, it sounds as if there's still plenty of life in them. I wouldn't give up on them yet. Do the winter pruning, and see what happens this year. I didn't find last summer very good for gooseberries, anyway. " "thank you Helen I hate throwing plants etc away so yes I will indeed stick with it... with greenish fingers crossed! " "Hi, John The best thing would be to check with the supplier of your bare-root plants, as they may already have done some trimming and I'd expect the supplier to give you instructions on what to do when planting. In general, though, after planting, you trim back branches to around 6 inches. " "Hi Helen, Wie planted our ribes in Nov 10, and trimmed the stems then and there. How much do you recommend I prune this winter? Apart from deseased, dead and touching branches? " "Don't do any more, Gudrun. They had a prune when you planted them. " "Thanks for the timely info on currants, ouch, I have pruned mine way too late previously. By any chance could you do a similar piece on raspberries and blackberries? I started with a few, planted them too close I think and now a few years later I have a huge mess. The original plants were expensive and I did get berries last year but I can't wade into the middle of them. Ideally I would like to cut everything down, dig them up in the spring and start over properly. Can they be pruned and cut back in winter like the currants? After pruning in the winter, can the currants be transplanted to a better location in the spring, oh and btw, what is the best soil and light condition for currants?" "PS. I LOVE these garden hints and the photos that go with them, however the photos are small. Is there some way for readers to zoom in the those lovely pictures?" "Patrice, you got us thinking. We'll have something on raspberries and blackberries in the next couple of weeks. " "Helen hi, I took a cutting from my Mum's Worcesterberry last year and at this time there's one branch/leg that's about 21 inches tall with bursting buds and new leaves, it also had a bud on the top that's now burst into leaves also. I was researching whether I should pinch the top to force bushy growth, however, after reading the above and checking the cutting, I'm confused as what to do for the best. Your advice would be most welcome"
"Hi, Terri. From your description, it sounds as if you haven't got any side branches coming off and for a one year old bush you're aiming to have around five shoots evenly spaced around the stem. Not sure if yours is over a year old or just a few months old, but it sounds as if it's put on quite a growth spurt? (Worcesterberries are known for their vigour.). I haven't grown a Worcesterberry myself, but in this position, and given the lack of side shoots, I'd cut back the leading shoot. By how much, would depend on how many places that side shoots might grow from around the stem, but by, say, one third. This should encourage bushing. Otherwise, it sounds as if you're getting a long leader with not much else. " "Helen hi, yes, it would appear there's one leader and little else, looks like it's put all its efforts into growing tall rather than bushy, thank you for advice. I'm going out there now, armed with the pruners to trim it back. Beware Worcesterberry....... hahahahaha Thank you again"
"I have some red currant bushes that I want to tackle for a neighbour, they have been growing un-pruned for maybe 4 or 5 years. Where do I start? Thank you"
"Hi, Jane. I suggest you go through the stages above. First cut out the dead and diseased wood, then remove any very low branches. Then start to open up the middle of the bush. If you can, look for whole branches that appear to be the oldest and cut these out. Try to eliminate branches that are crossing or growing towards the centre of the bush. Cut back the new growth on leaders by half. If your bush is very unkempt and tangled, I'd be tempted to pretty much leave it there so that it doesn't get too much of a shock after a long time without pruning. This year you can see how it performs, get to know the branches better and follow up pruning the side shoots next year. " "Hi Helen. Many thanks for your advice it will be really useful. I wont be starting today though ..... blommin snowing! Kind regards Jane"
"Many thanks for this information, I have just taken on an allotment and there are some well established and unruly looking gooseberry and currant bushes growing there! As soon as I get the chance I will be getting the pruners out and following your guide." "Hi Helen, we have today moved some of ourfruit bushes. We have dug up and transplanted the raspberries when tey have grown to we need to put up trelace or wire to train them along? Also the bushes redcurrant and blackcurrant are starting to shoot is it too late to prune? Thanks Nicola." "Can anyone advise me of the practical age limit for transplanting blackcurrants. I have 2 Boskoop Giants which are still cropping profusely after 20 years but I now want to move the whole soft fruit plot to a different part of the garden. Is it worth trying or should I start again with new stock?" "Thanks for the great article on pruning! I found it very helpful. I have gooseberries, currants and jostaberries that were planted in beds that are too narrow for them (so the bushes grow into the paths to the point of almost closing them off). Is it possible to cut these back entirely, leaving a single side shoot to replace the old leader, and then espalier them down the center of the bed as they grow back? It sounds like a bowl shape is ideal but would this be ok? Also, would it hurt the bush to take out that quantity of growth at once? Last question: I assume that this is better to do in the winter but is it too late to do it now? The paths are getting bad. We are willing to sacrifice fruit for a year or two... we just don't want to hurt the plants in the long term. Thanks again for your help!" "Way back in January I asked about the gooseberries I inherited from a dear friend; They were green and bush but no fruit – I did as advised and stuck with it I now have a small but encouraging crop of fruit Thank you so much . Peta , in SW France "
"we have a new red gooseberrie bush it only has to long shoots, do we need to pinch the tops out for it to bush out thank you. Linda"
"Oh boy ! I'm an old biddy but hooked on my garden. However, when I printed off your pruning instructions on Goosegogs, it was too small to read. HELP !" "Juliet, I suggest you copy the text into your word processing package and enlarge the font there before printing out. " "I am not sure when to prune. I live in Ontario, Canada, where the winters can be very cold and freak snow can come as late as April. One is not supposed to plant anything much until frost free target date of May 24. Is it best to prune November - December or between late March and late April ? Regards, Ulrike"
"re my submission in Jan- Good news I had a good crop of fruit this year - not large fruit- but plenty of them. Obviously ever comment helped so thank you one and all. NOW I need advice on ow to grow those big beauties I used to harvested in the UK peta in SW france"
"Ulrike, the Ontario Ministry of Agriculture and Food recommends pruning in late winter or early spring. The danger to gooseberries is the blossoms being damaged by snow and frost once the bush has sprouted into action in spring, rather than being pruned when the bushes are dormant. " "Hi Advisors I want to create some standard gooseberry plants hopefully starting with some cuttings I started a couple of months ago. Do I do what seems obvious and let the cuttings develop but keep removing low shoots to make a bare stem?" "Ian, if the cuttings are so young, I wouldn't remove anything. Leave the cuttings until they're a year old and then start training it next year by removing the side branches that you don't want. " "Help - am an inexperienced gardener and just need to know if I need to plant two gooseberry bushes or can I get away with one, ie., are they a self pollinator or not ? Same question regarding red currant bushes. Thx. 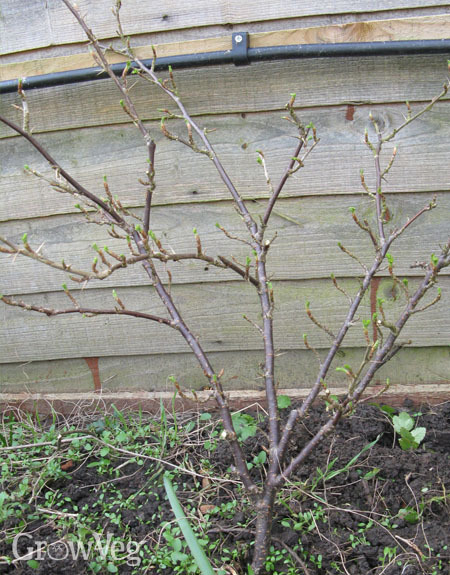 R"
"hi i have got a gooseberry bush that i planted last year its got lots of growth on it do i need to prune it back as no fruit this year"
"This is a really good article on pruning and I have read a few. What I didn't realise until it was to late is that sawflies, which I have been plagued with, seem to prefer the stool shapes to the goblet on a leg. I now have 4 gooseberries and a couple of whitecurrants which are stooled, between 3-5 years old. This may be a daft question but Is there any way I can convert these to a short legged bush or should I just start cuttings and train those into gobelts - it's a long time to wait.!" "Dear Helen, Is it better not to prune my gooseberry and redcurrant bushes at all in mid-April if I didn't do it when they were dormant? I live near Boston (USA), and both bushes have been actively producing over the past 3 years and never been pruned yet. Thank you!" "Hi, Michael. If you prune them now you're likely to prune off this year's flowers and so lose the fruit. I'd do some summer pruning later in the year and leave structural pruning till next winter. " "I would like to move my gooseberry and blackcurrant bushes to one area of my allotment for next year. Is it possible to relocate these bushes?" "Hi Steve. You could try relocating them if they aren't too big. Do this in the winter when they are dormant. Dig them up with as much of the surrounding soil as possible - this way you'll ensure the least possible disturbance to the roots. Plant them into their new planting holes and top up with a good mulch of well-rotted organic matter. But do this only once the plants have shed their leaves and gone into winter dormancy." "How can I tell what is dead and what is not? The wood seems strong but has no green places." "Hi Kath. Dead wood is usually darker and has no obvious growth or plump buds on it. Probably the easiest thing to do would be to snap an end of a branch to find out - if it is dead it will snap easily with a 'crack'. Alive/fresh wood is bendy and won't snap so cleanly." "We have an established red currant bush that gave us tons of fruit two summers ago. Last year and now this year, no fruit at all. It definitely needs pruning, but the bush is strong, appears healthy, and has lots of foliage. (We have gone through two exceptionally cold winters these last two years, but the bush is still growing.) Any ideas why no fruit two years in a row, after giving us bushels of berries the year before?" "Hi Edith. It does seem strange that after producing so well there is now no fruit. It could be birds (if so, rig up netting to keep them off the bushes) or it could be that the plants need feeding (apply an organic general purpose fertiliser in late winter). Pruning quite hard every winter does stimulate new spurs, from which the fruits will eventually appear. So while the plant may be showing lots of healthy growth, it may not be the best type of growth for fruit production. I'd recommend definitely pruning the bush this winter, as per the instructions above." "What a perfect collection of comments and advice and ideas! I'm also in Ottawa (hello, Ukrike!) and has exactly that question -- when is `winter' :-) Now I know -- and I'll mark it in my garden journal for late Feb. I have a red currant bush (this year perhaps 2 cups of berries ... the birds and chipmunks got the first 2 cups) but my black currant ... oh my! I'm now at 15.5 cups, all in the freezer, waiting for some small batch processing. And I have a very young gooseberry bush that a neighbour had brought up from Nova Scotia -- I'd been lamenting that the only ones available are the sweet varieties and I was looking for the sour ones I grew up with. I now have that -- just a scant cupful this year but I'm hopeful ... !" "Good luck for next year's gooseberry crop Christina!" "Hi. My gooseberry bushes are about 4 years old and have borne little or no fruit. Do you have any suggestions. Many thanks John"
"Hi John. It could be down to any number of factors. Make sure you attract pollinating insects into the area near your bushes by planting lots of other insect-attracting flowers nearby. Make sure plants have enough soil moisture as they go from flowering to fruit set. Watch out for birds, which may be stealing the fruit - throw nets over your bushes if necessary. Good pruning should also ensure a good branch structure and, hence, fruit quality and quantity. Good luck!" "We are learning how to care for a new garden, but have some inherited and found berry bushes that given good fruit for years. We did not know about the pruning till a gardener informed us. The berries are not as plentiful any more, especially the beautiful black currants. Pruning has not given the result we hoped for. How do we go about pruning bushes that have been unpruned for many years?" "Hi Marit. It does depend how old the fruit bushes are. If they are older than 10 years, which it sounds like they may well be, it's generally better to replace them and start again to ensure maximum vigour and plenty of fruit. If they are younger and seem like they may have life left in them yet, you can prune them in winter. For blackcurrants, begin by removing as much of the old growth as possible, retaining just the younger shoots. If all the wood appears to be old, cut all of the stems down to about 5cm (2in) to stimulate lots of fresh, new growth. Feed the shrubs and mulch around them once you've completed your pruning. When the new shoots come, select the strongest 10 and remove all others. You won't get fruit next year, but you should get fruit the year after." "Just like Willow cuttings, I've stuck Blackcurrant cuttings in the ground and seen the come to fruit in two years. Good strong plants as well. I've had equal success sticking the cutting into a large tub which housed the 'mother' of my cuttings. Sort of natural child birth for blackcurrants. Never need to buy new plants again"
"Blackcurrants are easily grown using cuttings. Fruit in two years"
"That's brilliant Eric - a nice, simple way to propagate this delicious currant." "hi, i'm writing from kodiak island alaska, and my black and red currants do crazy good here, except i should say USED to do crazy good. last couple of years not so good. in googling why that may be i've learned that i should have been pruning them all these 15 or so years! anyway i'm not sure where to start, in the comment from marit (august-2016) you suggest "If all the wood appears to be old, cut all of the stems down to about 5cm (2in) to stimulate lots of fresh, new growth"....so my question is by 'stem" do you mean the part emerging from the ground-- or-- the parts of the plant that are growing to the sides (what i would call branches) out of the part of the plant that is emerging from the ground. thanks for your help :)"
"Hi Debra. By stems I mean all of the parts emerging from the ground. Hope you manage to rejuvenate your currants and enjoy a good harvest once again."